UEFA President Michel Platini waits for the beginning of the preliminary draw for the 2018 soccer World Cup in Konstantin Palace in St. Petersburg, Russia, July 25, 2015. Platini, the UEFA president and a FIFA vice president, wrote to member federations in Europe on Wednesday saying he will stand in the election and is counting on their support. The FIFA election is on Feb. 26 and would-be candidates must apply by Oct. 26. Platini has for years been the obvious candidate to succeed Blatter, his mentor in FIFA politics. 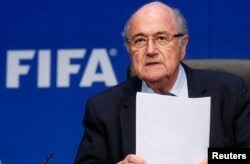 But a rift between the long-time allies deepened when Blatter broke a promise to leave office in 2015. FILE - Re-elected FIFA President Sepp Blatter arrives for a news conference after an extraordinary Executive Committee meeting in Zurich, Switzerland, May 30, 2015. ​Platini chose last year not to oppose Blatter, who won a fifth presidential term on May 29. Four days later, Blatter announced his resignation plans under pressure from American and Swiss federal investigations of corruption implicating FIFA. "However, recent events force the supreme governing body of world football to turn over a new leaf and rethink its governance,'' Platini said. Platini chose to run after getting encouragement from some of his fellow FIFA vice presidents last week in St. Petersburg, Russia. Five of the six confederation leaders, including Platini, were there for the 2018 World Cup qualifying draw with only the North American regional body missing. Platini then traveled to Philadelphia for the Gold Cup final on Sunday, and briefed CONCACAF leaders on his plans. They included FIFA executive committee colleague Sunil Gulati, the U.S. Soccer Federation president. The U.S. body was among the five FIFA members that nominated Prince Ali bin al-Hussein to challenge Blatter two months ago. The Jordanian prince was publicly supported by Platini but lost 133-73. What Must FIFA Do to Regain World's Trust?